This neat and simple arrangement was devised by Bill Dartnall, it allows a cage (or two) of drones to be transported using a Kirchhain mating nuc that is stocked with bees. This allows the drones to be fed and looked after by workers and allows transport to occur with far fewer losses of drones than is the case where drones are simply caged and do not have access to workers. The cage is the same dimensions as a fully drawn Kirchhain frame and simply slots in place instead of a normal Kirchhain frame that has these dimensions. For enrichment of particular apiaries with the genetics concerned so that natural matings may contain at least some of the genes. Late evening timed mating, where both drones and virgin queens are trapped inside hives until all flying activity by other colonies has ceased. Once queens and drones are released mating then takes place quickly and locally with no influence from drone assemblies (congregations) that might normally occur during the rest of the day. The drones are placed in the cage by hand through the hole in the top bar, which is kept closed with a finger of the hand holding the cage, between each drone. 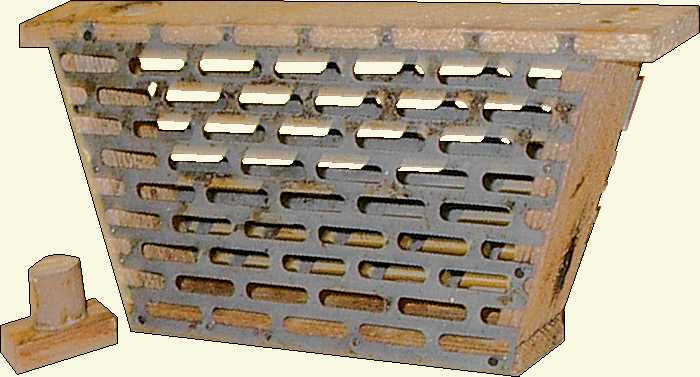 The drones are easily collected by leaning a wire queen excluder against the front of a hive, or drones of calibrated age can be used from other cages. When enough drones have been collected the stopper is placed in the hole and owing to the taper of it's plug will grip the hole firmly enough to transport.